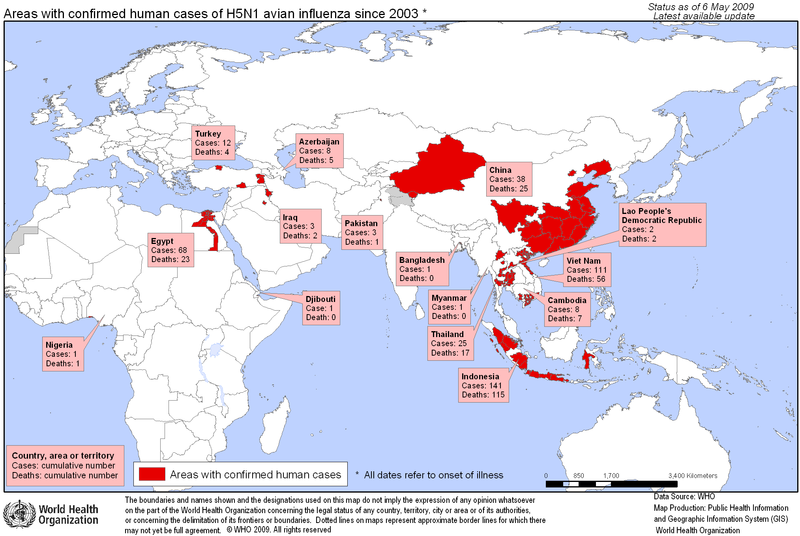 In 1997, a lineage of H5N1 bird flu was transmitted to a child in Hong Kong who died of respiratory problems. This was the first of a number of recorded cases of transmission of this virus from poultry to humans. Since then, the world follows the circulation of this virus with concern. Although we associate it to the severe cases in humans, this type of Influenza is also able to cause heavy symptoms in birds. Therefore, it is classified into two types: highly pathogenic or HPAI, which causes thousands of deaths in wild and domestic birds, and severe health problems in humans, and the low pathogenic or LPAI that infect birds and is asymptomatic. ……………………………………………………………………………………………………………………. The highly pathogenic H5N1 cause several health complications in humans, with nervous and hepatic damages, in addition to damages to the respiratory tract. Despite this, it is not efficiently transmitted among humans, being contracted by those in direct contact with domestic birds or close persons. The highly pathogenic H5N1 has a number of uncommon characteristics that concern us. The most obvious of them is the fatality; no other influenza is able to kill such a high number of the infected. More than half the persons that were confirmed to have contracted it died. Due to a number of complications that ranges from the most common such as respiratory problems to the most severe and rare such as neurological complications. From the 442 cases reported to the WHO up to now, 262 were fatal. It is important to emphasize the fatality must be less than that recorded, once not all go to hospitals, especially the asymptomatic cases. It is not only the cases in humans that concern us. Livestock are also seriously affected. Farms where outbreaks occurred resulted in high losses by infection, without considering the cases where the animals are sacrificed to prevent the spread of the virus generally to all other places and surroundings. In the wild environment, undomesticated animals are often found dead and tested positive to the virus, such as eagles and geese. Up to now, only one case of transmission between humans was confirmed in 2005, and some are still suspects but without confirmation. One sick child transmitted the virus to his mother, certainly involving close contact between them. This scarcity of contamination events between people indicate a low efficiency of the virus in propagating among humans. Even not being transmitted between humans, scientists, health agents and the government closely monitor the circulation of H5N1. In the next text, we will see the characteristics of the virus that can contribute to the prevention of its transmission and those that explain its pathogenicity, and what else that give us more reasons to worry about.